Nomad Press (VT), 9781619301511, 128pp. Life is everywhere, thriving in the city and in the country, teeming in ecosystems around the planet--in deserts, oceans, and even the Arctic. 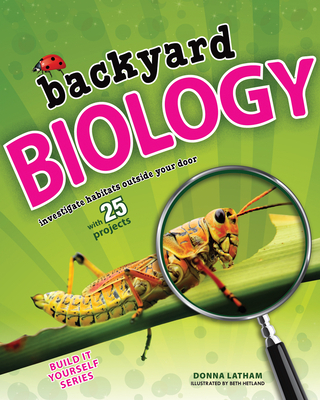 And life is right outside your door Backyard Biology invites children ages 9 and up to investigate living things--especially in yards, parks, nature areas, and playgrounds. Trivia and fun facts bring animals, plants, and microorganisms to life, in all their wonder. Readers become Nature Detectives with activities and projects that encourage children to make discoveries. Children will construct a plankton net to collect pond samples, and they'll grow microorganisms in a Winogradsky Column. They'll discover what mystery plants sprout from collected soil samples and build a rolypoly habitat. When children experiment with phototropism and geotropism, they'll discover the ways plants move. In Backyard Biology, children will scout out different habitats to observe and investigate--and do their part to protect them. Donna Latham is an award-winning author and playwright. She is the author of Amazing Biome Projects You Can Build Yourself, Backyard Biology Investigate Habitats Outside Your Door With 25 Projects, Deciduous, Forests, Deserts, Garbage Investigate What Happens When You Throw It Out With 25 Projects, Norah Jones, Oceans, Respiration and Photosynthesis, Savannas and Grasslands, and Tundra. She is a member of the Society of Children's Book Writers and Illustrators and the Society of Midland Authors. She lives in Batavia, Illinois. Beth Hetland is an illustrator who has an MFA from the Center for Cartoon Studies. She lives in Chicago, Illinois.